Before I get to this week's recipe, I want to give you an opportunity to have a recipe featured here. On the final Friday of each month, I will feature another blogger's recipe. If you are interested in being the featured blogger next Friday (the 28th), please email me at peedeemama@gmail.com. Most days we spend the majority of our afternoon at soccer practices and ballet rehearsals. It doesn't leave a lot of time for me to cook so I do a lot of slow cooker meals. 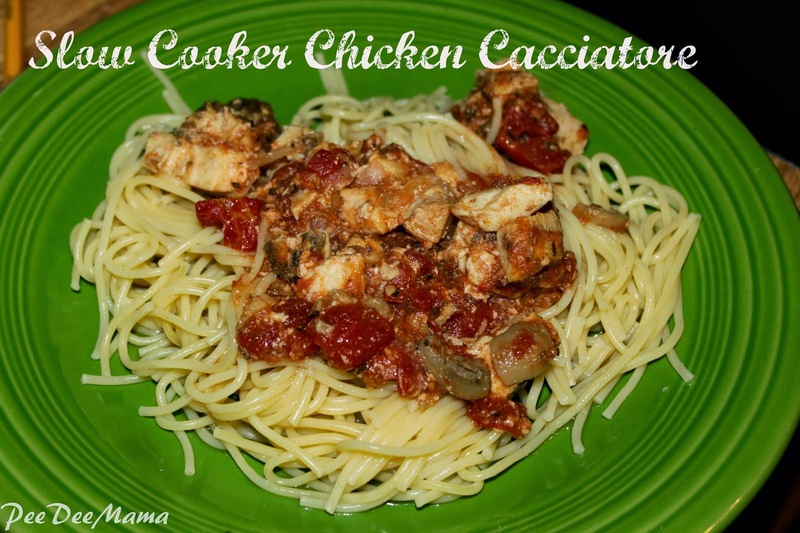 I got this slow cooker chicken cacciatore recipe from my Fix It & Forget It cookbook. I can remember my mom making chicken cacciatore when I was a child, but it wasn't in the slow cooker. She would stand over the skillet for a good long time getting it just right. I don't have that kind of time in the afternoons and evenings, so I was excited to find a slow cooker recipe to try. Place onions in bottom of slow cooker. Add remaining ingredients. Cover and cook on low for 8 hours. Serve over hot spaghetti. Do you have a recipe you'd like to share? Link up below.